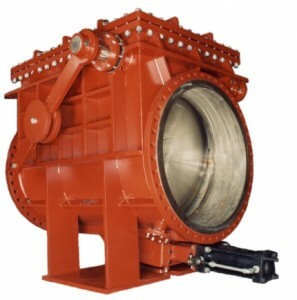 The H-950 is designed for horizontal or vertical flow (not suitable for down-flow applications). When fully open the valve disk is out of the flow area allowing for 100% uninterrupted flow. The valve comes equipped with a bolted cover which can be removed while the valve is in the line. The connection between the disk and disk arm allows disk to move for precise alignment with seating surface. The valve is available with external counterweight and dampener. The H-950 can be fabricated from any weldable alloy and is clearly marked to show direction of flow.